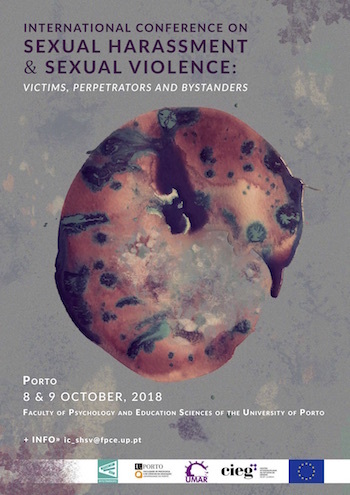 The Faculty of Psychology and Education Sciences of the University of Porto (FPCEUP), the Women’s Association Alternative and Response (UMAR) and the research project "Bystanders - Developing bystanders’ responses to sexual harassment among young people" are pleased to invite you to the "International Conference on Sexual Harassment and Sexual Violence: Victims, perpetrators and bystanders" which will be held on the 8th and 9th October 2018 at FPCEUP, Porto, Portugal. The aims of this International Conference are the following: to bring together researchers, academics, doctoral students, practitioners, and policy makers; promote the development of research and practices on preventing and combating sexual harassment and sexual violence; debate conceptualisations and perspectives on sexual harassment and sexuxal violence; connect research and intervention in the field; provide a forum for networking among researchers and practitioners; share intervention strategies to better protect victims of sexual harassment and sexual violence; disseminate and share research findings of the Project “Bystanders - Developing bystander responses to sexual harassment among young people”; and share research findings on social and judicial policies about sexual harassment and sexual violence. The conference will have as keynote speakers Liz Kelly, Marceline Naudi and Alessandra Pauncz. The official languages used throughout the conference will be Portuguese and English. During the first day of the conference we will present and discuss the results of the research project “Bystanders - Developing bystander responses to sexual harassment among young people” that involved 4 countries: Portugal, United Kingdom, Malta and Slovenia. Youngsters and teachers who participated in the project will share their experiences. These sessions on the first day are open to all participants and could be an opportunity for networking and implementing Bystanders’ Project in other countries. On the second day there will be presentations on several discussion panels. Abstracts can be submitted from 22nd may to 30th June 2018 here. Notice of acceptance will be sent by the 15th July. Each person can only submit, as first author, one abstract per presentation format (oral and poster presentations will be accepted). The abstract should have 300 words maximum and 3 keywords.